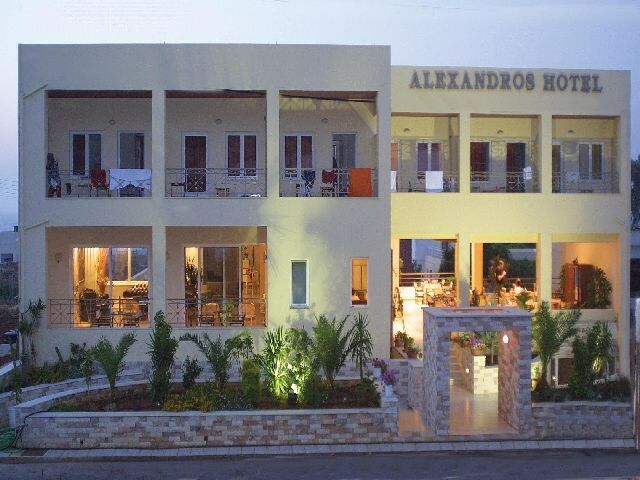 ALEXANDROS hotel is 300 m far from the beach and 700 m far from the village center. In ALEXANDROS hotel you can find 24 - hour reception services. Apart from any other information you may need, at the reception you can also ask for room or vallet service, exchange, ask for a taxi or a safety box (with extra charge). You can also rent a car or book for the private excursions organised by ALEXANDROS. In this area you can also find business desk facilities and an internet corner. There is a playroom for the children and a playroom for the adults, where you can find video games and pool table or you can play chess, cards. And if you don't want to play indoors you can just go to the beautiful, tilled swimming pool, that is decorated with mosaics of the minoan images. Lie down on a sunbed under an umbrella with no charge or sit in the snack bar that is there for a drink.